To celebrate The American Scholar's thirtieth anniversary, Hiram Haydn and Betsy Saunders brought together fifty representative selections published throughout those years. These selections include the best essays that appeared throughout the life of one of the leading publications of the country. The editors give a picture of the changing intellectual climate and emphasis from the early 1930s to the late 1950s. The collection illustrates the unusually wide range and diversity of the regular subject matter of The American Scholar. This work is once again brought to public attention a half century later, and this edition includes a new introduction by Irving Louis Horowitz.Haydn and Saunders chose essays that were of supreme quality; those included were among the best of several hundred published. They focused on a diversity of subject matter as well as a selection representative of the different interests stressed in the magazine's history. These pieces reflect the prevailing intellectual and cultural currents of fifty years earlier. 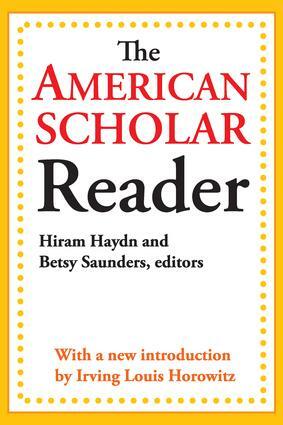 The American Scholar Reader then, as now, focuses on themes of economics, religion, psychology, social and cultural matters, ecology, and the importance of conservation.Some of the major contributors and essays herein included are: 'The Germans: Unhappy Philosophers in Politics,' Reinhold Niebuhr; 'The Challenge of Our Times,' Harold J. Laski; 'The Problem of the Liberal Arts College,' John Dewey; 'The Retort Circumstantial,' Jacques Barzun; 'Freud, Religion, and Science,' David Riesman; 'Three American Philosophers,' George Santayana; 'Christian Gauss as a Teacher of Literature,' Edmund Wilson; 'The Pseudo-Conservative Revolt,' Richard Hofstadter; 'The Present Human Condition,' Erich Fromm; 'Our Documentary Culture,' Margaret Mead; and 'Equality America's Deferred Commitment,' C. Vann Woodward. The Devil Is Dead, and What a Loss! Machiavelli's Prince: Political Science or Political Satire?